And by “where it belongs,” we mean away from your home and yard. We design stormwater collection and removal systems that naturally direct the flow of stormwater away from your property. Built for long-term reliability with minimal maintenance, our systems are a practical alternative to interior, “after the water gets in,” drainage installations. These exterior drainage systems are designed to facilitate the flow of stormwater away from your home. Is water accumulating around your home? Our installations collect and channel stormwater away. We also work to identify and correct other conditions which allow water to collect around the structure or in other problem areas. 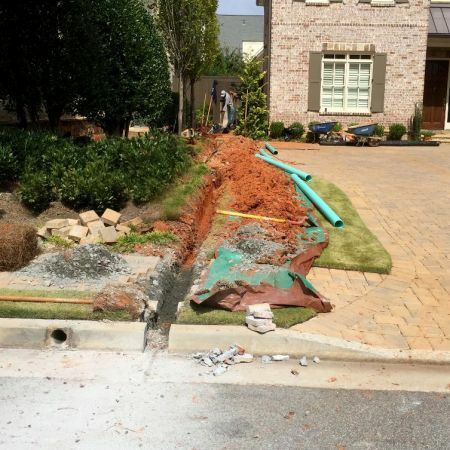 Using durable piping and advanced installation techniques, we facilitate the consistent flow of stormwater away from your home – to a proper location – and out of your life. Do your downspout drain lines clog easily or fail to work properly? We install durable PVC downspout drain lines to collect gutter and downspout water at the source. In driveways, walkways, or turf areas, catch basins and channel drains can effectively capture stormwater and direct it away from your home. Consisting of perforated PVC pipe, filter fabrics and real drainage rock, french drains remove ground saturation and improve saturation conditions in the surrounding soil. Black corrugated pipes? Those are flimsy and prone to failure. We install durable, long-lasting, thick-walled PVC in our drainage solutions. Backfill around your basement or crawlspace may settle, collect water, and cause water to enter your home. When necessary – and as required – we restore backfill conditions. Grade corrections can provide a permanent, zero-maintenance, non-mechanical drainage solution. If it wasn’t done right the first time, we’ll make sure it’s done right this time. Strategic landscape or hardscape improvements or installations often play a major role in drainage correction. In some cases, these improvements are the drainage system.